I want me a port o bif! What a great find. A real glimpse into the the strange world of the 60's. My husbands grandfather built a fall-out shelter in his house purchased in 1967. When we'd visit him we'd stay in the guest room right off the shelter. Pretty wierd. Joel's aunts and uncles have great stories about playing in the shelter. Me, I never ventured in. OMG! this is funny and scary all the same time. Have you seen The Atomic Cafe? it's the same but in video format. YAY! A bomb! It all looks like so much fun! 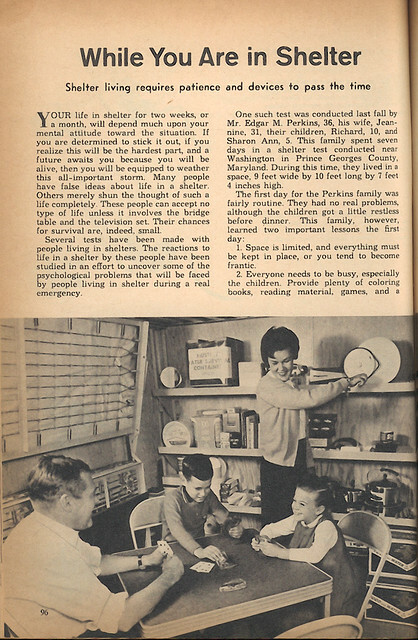 I used to love the idea of bomb shelters as a kid. Funny now I suppose. I was in third grade in 62 and we had atomic bomb drills on a regular basis. Stay away from the windows, get under your desk etc. I remember one math exercise where the teacher would pin point a location and have us calculate the various components of a blast radius for a given mega tonnage albeit ground burst or air. These lessons were carried over into the afternoon science class on topics of meteorology, the prevailing seasonal winds and likely directions of drift of a radioactive cloud. Given our geographic location, we felt reasonably safe, leastwise more so than any school age child that might be found in Chicago, New York, Los Angeles or in any proximity of a major military installation as Russian ICBM's on the polar route MIRV'd over western Canada. I suppose bomb shelters like school desks gave room for hope that such was survivable though most people wouldn't have. It was more important that people have hope and many profitable cottage industries rose up to support the premise. While the eminent threat of nuclear exchange is greatly diminished today, the potential for social collapse among modern societies is much greater, the resulting carnage almost beyond comprehension with any advanced preparation no less than equally absurd. Hey, Man. I like your blog. I saw this post on BoingBoing, and the phrase 'Inman Park' caught my eye. I live in the ATL, too, and know someone you may know from work, John Kay? Small world, small town. In the mid-90's, I went to a yard sale that Agnes Scott was having, and bought a 25lb canister of 'Carbohydrate Candy' and a wicked looking can opener that they had stored up with a bunch of other junk 'just in case'. Funny how long it takes us to purge out that stuff. Ahh the good old port o bif. Takes you back doesn't it? 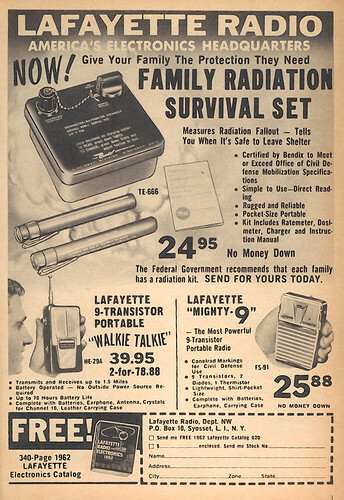 People make fun of ""Duck and Cover", fallout shelters, and hiding under the desk; But there are many situations where these simple precautions could save lives. Not everyone is going to be mail blast radius, and staying underground a few days til the worst of the fallout decays would really work for a lot of people. Civil Defense fell by the wayside in the early 70s, but Carter revived it. FEMA was created as a system to deal with nuke attack. Its backers used hurricane and earthquake response as a cover. If the original FEMA program hadn't been gutted in the 80s, we could have cleared out much of NOLA in a couple of days. Much of Houston tried to evacuate for Rita ant there was nothing but meyham on the freeways. The original FEMA plan would have had us all out in two days. 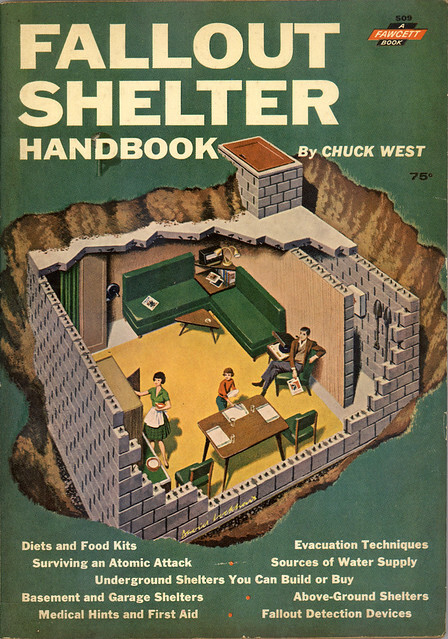 The Civil Defense agency had a set of plans available for building a bomb shelter, around 1962. One of those cutaway images seems to be similar. And, yes, one could go to the Home Depot equivalent (Hechinger's) to get the stuff to build one's own or to modify a house (sandbagged under-stairwell shelter). 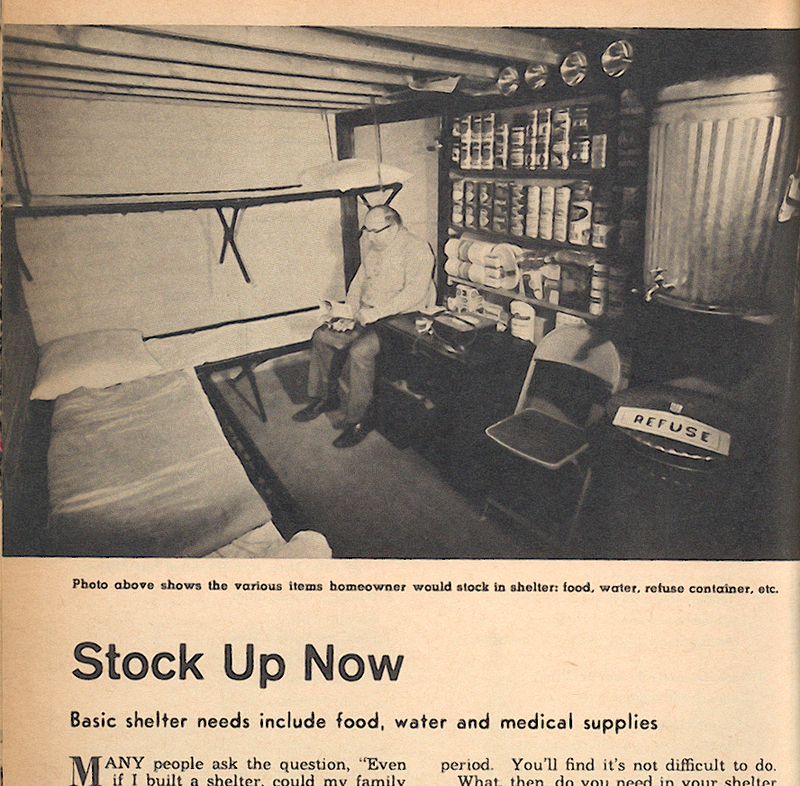 Other than the futility of building a "bomb" shelter, the idea of preparedness is still good. After using the Port-O Biff. So "its" in there. THEN what? This post makes me want to listen to Donald Fagen's "The Nightfly" album. Not to rain on most of you guys parade but while civil defense is gone, the nukes are not. Hello? A terrorist nuke is very possible in which case Duck and Cover could save your life. Watch it on Google video. Go to www.physiciansforcivildefense to learn more. I was trained in the US navy to launch nukes from submarines. I know whereoff I speak. Great handbook. A collectors item! 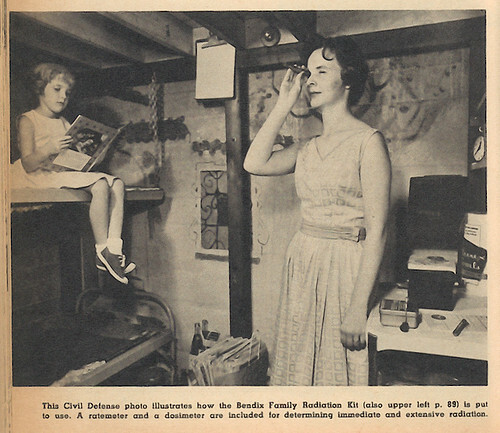 What killed off the home bomb shelter was the dawning realization of just how long you'd have to stay inside one. It's not like "Jericho" on TV, where a good rainstorm washes it all away, and everything outdoors is normal again. If you were somewhere that you needed to be in a fallout shelter, you'd need to be in it for years. Not days, not weeks, but years. The chance of agriculture surviving both the initial radiation and years of neglect in any meaningful way is pretty slim as well. On a globe, everybody's downwind of everybody else. Nobody wins in nuclear war. 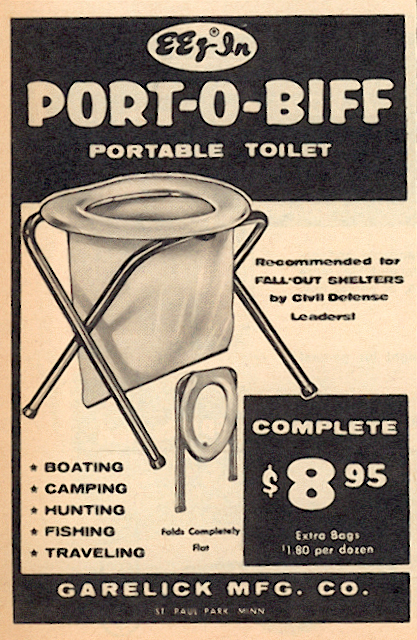 Oh, but the good news is that most camping stores still sell the Porto-Biff, if not by that name. Since all the best evidence starts with "I once saw on TV", I have a vignette to share. I once saw this show on TV where survivors of hiroshima were interviewed. One guy said that at the time of the blast he was at a swimming pool and jumped in. When he surfaced many people had very very serious burns. He didn't. I've studied this stuff on and off for several years as a hobby, and as I remember the swimming pool trick might actually work. Of course, the radiation levels would still have been astronomical when he surfaced. It is good for hurricane too. I had a friend who's Dad was quite paranoid and installed a secret bombshelter/underground food storage at night so no would know about it. Of course my friend told me and everyone else so it ended up being not-so-secret. That was like 10 years ago. I don't know if they had a Port-o-Biff though. I grew up in Atlanta in the 60's and my industreous uncle built a bomb shelter in the parking lot of Cambellton Plaza shopping center, west of the city. I don't know that he ever sold one, but it was fun to visit. My grandmother stocked mason jars full of water "just in case". Ah, the innocence. Fallout shelters are still built in Switzerland in all residential houses and most underground carparks are fallout shelters. Its the law, they MUST do it. I am amazed! 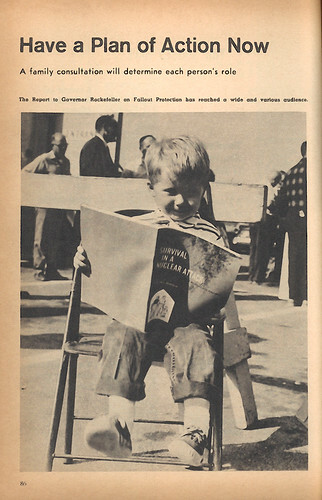 I did a senior these for my bachelor's on the Atomic Age, & would have given anything to have had a copy of this booklet. I have several others from 1961, but they are not as nice as this one. One of the best ones is "You CAN Survive Atomic Attack" by W. Libby (invented the term "fallout" & discovered the atomic clock). Most people of today's generation are CLUELESS regarding fallout, radioactive decay, preperation and survivability of a nuclear attack. Check out the facts, and prepare while you can. I have to laugh at the people who think shelters are useless or somehow not politically correct. It's like the story about the ant and the grasshopper. Great work, keep it up! Very Cool my parents never game fallout shelters much thought really makes you thin k how close we were and are to an attack. 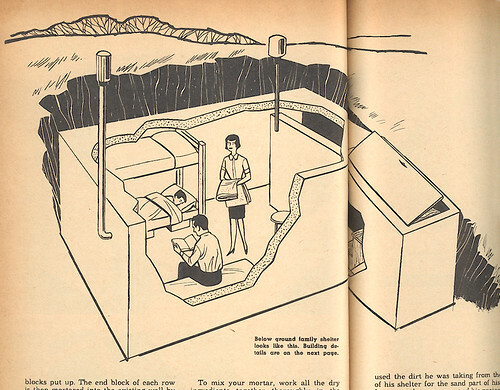 I'm interested in using the first bomb shelter image in a book of U.S. women's history (entitled Women Making America) that I am publishing this year. 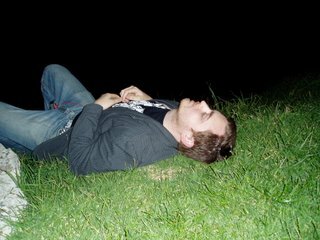 Is there a chance that I can get a higher res image from you? I would really love it. That was from a cartoon - Futurama. When Leela thinks she has met another of her own kind (human looking, but only one eye). The episode mocked "Married with Children." The guy's story was that he was cleaning a pool when he saw the planet being destroyed. He jumped in and when he came back out he was the only person left. The story was a lie, he was an impostor. Cool manual. I recall seeing something like it when I was a kid. My daddy prepared for the A-Bombing of Atlanta during the Cuban deal. Bricks in the basement windows, stocks of canned food, flashlights, blankets, a monopoly set and etc. I find it humorous that so many today believe a nuclear exchange equates to doomsday. Of course the science strongly suggests otherwise. So laugh not. Duck and cover plus the information in this kind of manual could save you just as it was designed to do 45 years ago. I remind you your alternative is to rely on FEMA. If that's your strategy, then oh well. Those interested in the history of the fallout shelter, the cold-war mentality and the ethical debates that fallout shelters provoked, and the expressions of this debate in newspapers, magazines and television (including the famous Twilight Zone episode "The Shelter") should check out the book, "One Nation Underground: The Fallout Shelter in American Culture" by Kenneth D. Rose. It's very readable and entertaining. The ridiculous belief that via some 'Mad Max' type outcome, we'd continue as a life-as-we-can-imagine it - is beyond stupid. We'd all die within 3 months. After pounding the dirt in our backyards with a claw hammer wishing we could find a few more worms - we'd be done. War is not healthy for the continuation of our species. Yet those of us who are accidentally saved from such a life, try not to think about that and slide between our comfy sheets, safe in the knowledge that if 'they' come for us, we have shotguns, pistols and semi-automatics to protect us. Hey, I emailed Ward about the nations first bomb shelter or fallout shelter. Turns out the owner was an aniimator, illustrator, etc. Are there any shelters that can be built to protect against hypobaric and thermobaric bomb's? I remember having nightmares as a kid during the Cuban missle crisis. My dad comforted me by explaining the idea of mutually assured destruction. Today, as an adult living 15 blocks from the White House, my plans for a nuclear event amount to keeping a bottle of Veuve Cliquot chilled for toasting the trails of the incoming missles, although it's kind of a shame I won't have time to finish the bottle.